This Nine-Patch wall quilt gets its inspiration from the simple, classic lines and colors of antique Amish quilts. The bold geometric patchwork is softened by the gentle curves of quilted feathers and cables. Classic and timeless, this is a quilt that bridges the span from traditional to modern. Finished size is 22" X 22". 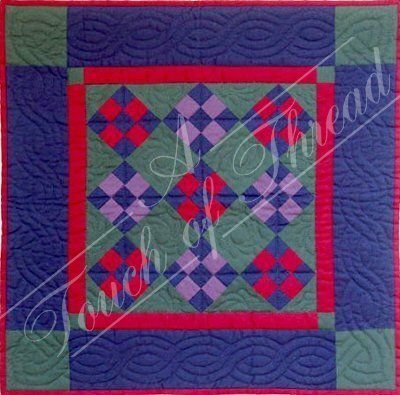 Kit includes all 100% cotton fabrics needed to complete the quilt (including quilt top, backing, and binding), plus batting, precise patterns, complete instructions and quilting designs. Colors are dark red, green, navy, and muted purple.